For Vajrapāṇi in Hinduism, see Indra. Vajrapāṇi (Sanskrit: "Vajra in [his] hand") is one of the earliest-appearing bodhisattvas in Mahayana Buddhism. He is the protector and guide of Gautama Buddha and rose to symbolize the Buddha's power. Vajrapāni is extensively represented in Buddhist iconography as one of the earliest three protective deities or bodhisattvas surrounding the Buddha. Each of them symbolizes one of the Buddha's virtues: Manjushri manifests all the Buddhas' wisdom, Avalokiteśvara manifests all the Buddhas' immense compassion, and Vajrapāni protects Buddha and manifests all the Buddhas' power  as well as the power of all five tathāgatas (Buddhahood of the rank of Buddha). Vajrapāni is one of the earliest Dharmapalas of Mahayana Buddhism and also appears as a deity in the Pali Canon of the Theravada school. He is worshiped in the Shaolin Monastery, in Tibetan Buddhism and in Pure Land Buddhism (where he is known as Mahasthamaprapta and forms a triad with Amitābha and Avalokiteśvara). Manifestations of Vajrapāni can also be found in many Buddhist temples in Japan as Dharma protectors called Nio. Vajrapāni is also associated with Acala, who is venerated as Fudō-Myōō in Japan, where he is serenaded as the holder of the vajra. Vajrapāni is a compound word in Sanskrit in which 'Vajra' means "thunderbolt or diamond" and 'pāni' means "in the hand". Vajrapāni's expression is wrathful, and is often symbolized as a yaksha, to generate "fear in the individual to loosen up his dogmatism." His outstretched right hand brandishes a vajra, "symbolizing analytical knowledge (jñanavajra) that disintegrates the grasping of consciousness Although he sometimes wears a skull crown, in most depictions he wears a five-pointed bodhisattva crown to depict the power of the five Dhyani Buddhas (the fully awakened state of the Buddha). The mantra oṃ vajrapāṇi hūṃ phaṭ is associated with Vajrapāni. His Seed Syllable is hūṃ. In early Buddhist legends, Vajrapāni is a minor deity who accompanied Gautama Buddha during his career as a wandering mendicant. In some texts he is said to be a manifestation of Śakra, king of the Trāyastriṃśa heaven of Buddhist and Hindu cosmology and god of rain as depicted in the idols of the Gandharva. As Śakra, it is said that he was present during the birth of Tathagata. As Vajrapāni he was the god who helped Gautama escape from the palace at the time of his renunciation. When Sakyamuni returned from Kapilavastu he is stated to have assumed eight forms of devas who escorted him. According to Xuanzang, the Chinese monk and traveler, Vajrapāni vanquished a large serpent at Udyana. In another version it is stated that while the Nāgas came to worship the Buddha and hear his sermons, Vajrapāni assumed the form of a bird to deceive them so that they were not attacked by their deadly enemies, the Garudas. According to the Pañcaviṃsatisāhasrikā- and Aṣṭasāhasrikāprajñāpāramitās, any bodhisattva on the path to buddhahood is eligible for Vajrapāni's protection, making them invincible to any attacks "by either men or ghosts". In Cambodia, three monasteries dated to 953 AD are dedicated to the worship of the triad of the Buddha - Prajnaparamita and Vajrapani; image of Vajrapani with four arms is venerated in one of these monasteries. Also, in niches are standing images of Vajrapani carved with four or two arms on each of the four faces of monoliths found in Western Cambodia. Vajrapāni as Heracles or Zeus, second-century. As Buddhism expanded in Central Asia and fused with Hellenistic influences into Greco-Buddhism, the Greek hero Heracles was adopted to represent Vajrapāni. In that era, he was typically depicted as a hairy, muscular athlete, wielding a short "diamond" club. Buddhaghosa associated Vajrapāni with the deva king Indra. Some authors considers that the deity which is depicted is actually Zeus, whose Classical attribute is the thunderbolt. During the Kushana period Gandhara art depicted Vajrapani's images in which he is shown primarily as a protector of Sakhyamuni and not in the role of a bodhisattva. In the Indrasalaguha scenes, mountains form a part of his environment where his presence during the conversion of the naga Apalala is shown. In these depictions he is shown wearing exclusive Western attire and always in the presence of other deities. The reliefs in this art form depict Vajrapani always present in the scenes where Buddha is converting people; his presence is shown when the Buddha confronts the opponents of the dharma like Mara before his enlightenment. Scenes of Shakyamuni competing with the heretics are also part of this art tradition. Scenes of Buddha using the vajra of Vajrapani as the "magic weapon" to perform miracles and propagate "superiorty of his doctrine" are also common. In the eastern group of caves at the entry to cave 6 in Aurangabad, Vajrapani is carved as a commanding persona in the form of a huge dvarapala along with Avolokiteśvara. Vajrapani image is flanked by a small attendant. He carries Vajra, his luminous weapon on the left hand, which rests on a scarf tied across his hip. His right arm is bent forward -perhaps he held a lotus like his paredros Avalokiteśvara. Both the bodhisattvas guarding the entrance to cave 6 are carved wearing princely headdresses (crowns). In Indonesia, Vajrapani is depicted as a part of triad with Vairocana and Padmapani. A famous 3 metres tall stone statues of Vairocana, Padmapani, and Vajrapāni triad can be found in central chamber of Mendut temple, located around 3 kilometres east from Borobudur, Central Java. Both seated Padmapani and Vajrapani, regarded as the guardian of Buddha Vairocana, are depicted as a handsome well-built men with serene expression adorned with exquisite crown and jewelries. The statues are the fine example of the 9th century Central Javanese Sailendran art, which influenced the Buddhist art in Southeast Asia, including Srivijayan art of Sumatra and Malay Peninsula (Southern Thailand). In Japan, Vajrapāni is known as "the head vajra-wielding god" (執金剛神, Shukongōshin), and has been the inspiration for the Niō (仁王, Benevolent Kings), the wrath-filled and muscular guardian gods of the Buddha, standing at the entrance of many Buddhist temples under the appearance of frightening, wrestler-like statues. He is also associated with Acala (不動明王, Fudō-myōō); the mantra for Fudō-myōō references him as the powerful wielder of the vajra. The origin of the image of Vajrapani should be explained. This deity is the protector and guide of the Buddha Sakyamuni. His image was modeled after that of Hercules. (...) The Gandharan Vajrapani was transformed in Central Asia and China and afterwards transmitted to Japan, where it exerted stylistic influences on the wrestler-like statues of the Guardian Deities (Nio). In Japan, though he is not a very popular form of statue worship, he is frequently depicted in diagrams (Mandala); the sixth formation of the Garbakhosa mandala is named as "Vajrapani enclosure" in which he is represented in 20 different forms with Kongsatta as the presiding deity. In Japanese iconography he is depicted in red colour at the death of Buddha. In Nepal, Vajrapani is depicted holding a vajra supported on a lotus with its stem held in the right hand while the left hand is shown in a posture of "charity and argument". His paintings are in white colour. In Tibet, Vajrapani is represented in many fierce forms. Some of the notable ones are: Vajrapani-Acharya (Dharamapala) in a human form with only one head with a third eye with hair raised and crowned by a skull with fiery expression. His neck is adorned with a necklace of snakes, and with waist band made of tiger skin covered with skulls. Stepping to the right, his lifted hand holds a vajra. When painted in blue colour the image is encircled by flames with images of small Garudas;  Nilambara-Vajrapani with one head, with a third eye, a crown made of skull with four or six arms and in some cases with untidy hair bedecked with vajra and snake. Two hands are crossed to the breast in mystic posture (mudra), the second right hand is lifted up and carries a vajra. Stepping to the right, regally crowned and lying over a bed of snakes; in Achala-Vajrapani form he is shown with four heads, four arms and four legs adorned with symbols of vajra, sword, lasso and skull cup (kapala) and trampling over demons; Mahachakra-Vajrapani is a form with three heads and a third eye, and with six arms and two legs. The icon is adorned with symbols of vajra, snake with yum held in its main hands, and as shakti it to his left is shown holding a skull-cup (kapala) and grigug (chopper or hooked knife). The icon is shown stepping over Brahma on the right and on Shiva to the left; in the Thunderbolt-Wielder form known as "snake charm form" to protect from snake bites, he is depicted sitting on a lotus throne carried by peacocks. The right hand posture holds one end of rope noose to capture snake demons while the left hand held over the hips carries the other end of the noose. He is followed by two bodhisattvas - "Sarvanivarana-Vishkambhin, Effacer of Stains, and Samantabhadra, the Entirely Virtuous One". His adornments consist of a tall crown and snakes coiling his arms and ankles. In a painted form, usually in white colour "crossed-vajra" is held to the left raised above the accompanying Bodhisattvas but when painted in blue colour the left hand holds a double vajra; his Garuda form is with wings and claws or with human head with a beak or head with wings fully spread (his painted form is in blue colour). he may be trampling over a demon or dead naga (snake). In some images he is shown carrying a sword, a bottle in the shape of a gourd, a chopper or hands held in a prayer mode. In literature and art Vajrapani has a prominent place with his identification as a yaksha leading becoming a full scale bodhisattva. This, reflected through the Mahayana sutras has become an "emblem of esoteric knowledge and the revealer of Buddhist Tantra". In the role of yaksha, his special relationship with mountains and caves is established. According to E. Lamotte, author of books on Buddhism, Vajrapani was the chief of Guhayakas genies des cavernes or secret yakshas, who played a mysterious role in the Buddhist and brahmanical literature of India. Lamotte based his assessment on many textual passages which explained Vajrapani's use of his magic vajra to rock the mountains. The story of importance in this context narrated in the Mulasaravasitivada vinaya, is the encounter between the Buddha and Devadutta in which Vajrapani's vajra strength to destruct the rock is brought out. In another textual reference, in the Sarvastivada vinaya vibhasha, Vajrapani protects the pradakshina path adopting his magic weapon. This fact is verified in the location of huge Vajrapani images in cave 6 at Aurangabad both at the entrance and exit end of the passage where circumambulation terminates. 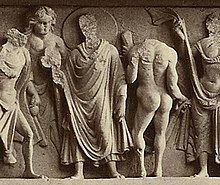 The Buddha and a naked Vajrapani in a frieze at Jamal Garhi, Gandhara. The Pāli Canon's Ambattha Sutta, which challenges the rigid nature of caste system, tells of one instance of him appearing as a sign of the Buddha's power. At the behest of his teacher, a young Brahmin named Ambatha visited the Buddha. Knowing the Buddha's family to be the Shakya clan, who are Kshatriya caste, Ambatha failed to show him the respect he would a fellow Brahmin. When the Buddha questioned his lack of respect, Ambatha replied it was because the Buddha belongs to a "menial" caste. The Buddha then asked the Brahmin if his family was descended from a “Shakya slave girl”. Knowing this to be true, Ambatha refused to answer the question. Upon refusing to answer the question for a second time, the Buddha warned him that his head would be smashed to bits if he failed to do so a third time. Ambatha was frightened when he saw Vajrapāni manifest above the Buddha's head ready to strike the Brahmin down with his thunderbolt. He quickly confirmed the truth and a lesson on caste ensues. A popular story tells how Vajrapāni kills Maheśvara, a manifestation of Shiva depicted as an evil being. The story occurs in several scriptures, most notably the Sarvatathāgatatattvasaṅgraha and the Vajrāpanyābhiṣeka Mahātantra. The story begins with the transformation of the bodhisattva Samantabhadra into Vajrapāni by Vairocana, the cosmic Buddha, receiving a vajra and the name "Vajrāpani". Vairocana then requests Vajrapāni to generate his adamantine family in order to establish a mandala. Vajrapāni refuses because Maheśvara "is deluding beings with his deceitful religious doctrines and engaging in all kinds of violent criminal conduct". Maheśvara and his entourage are dragged to Mount Meru, and all but Maheśvara submit. Vajrapāni and Maheśvara engage in a magical combat, which is won by Vajrapāni. Maheśvara's retinue become part of Vairocana's mandala, except for Maheśvara, who is killed, and his life transferred to another realm where he becomes a Buddha named Bhasmeśvaranirghoṣa, the "Soundless Lord of Ashes". According to Kalupahana, the story "echoes" the story of the conversion of Ambattha. It is to be understood in the context of the competition between Buddhist institutions and Shaivism. Vajrapāni at Mogao Caves's Hidden Library, Dunhuang, China. Power and anger personified. Late 9th century, Tang dynasty. Ink and colors on silk. According to the scripture [Lotus Sutra], this deity (Narayana) is a manifestation of Avalokitesvara (Guanyin). If a person who compassionately nourishes all living beings employs this [deity's] charm, it will increase his body's strength (zengzhang shen li). It fulfills all vows, being most efficacious. ... Therefore those who study Narayana's hand-symbolism (mudra), those who seek his spell (mantra), and those who search for his image are numerous. Thus we have erected this stele to spread this transmission. He was historically worshiped as the progenitor of their famous staff method by the monks themselves. A stele erected by Shaolin abbot Wenzai in 1517 shows the deity's vajra-club had by then been changed to a gun staff, which originally "served as the emblem of the monk". Vajrapāni's yaksha-like Narayana form was eventually equated with one of the four staff-wielding "Kinnara Kings" from the Lotus Sutra in 1575. His name was thus changed from Narayana to "Kinnara King". One of the many versions of a certain tale regarding his creation of the staff method takes place during the Yuan-era Red Turban Rebellion. Bandits lay siege to the monastery, but it is saved by a lowly kitchen worker wielding a long fire poker as a makeshift staff. He leaps into the oven and emerges as a monstrous giant big enough to stand astride both Mount Song and the imperial fort atop Mount Shaoshi (which are five miles apart). The bandits flee when they behold this staff-wielding titan. The Shaolin monks later realize that the kitchen worker was none other than the Kinnara King in disguise. Shahar notes the part of the kitchen worker might have been based on the actual life of the monk Huineng (638-713). In addition, he suggests the mythical elements of the tale were based on the fictional adventures of Sun Wukong from the Chinese epic Journey to the West. He compares the worker's transformation in the stove with Sun's time in Laozi's crucible, their use of the staff, and the fact that Sun and his weapon can both grow to gigantic proportions. Statues and paintings of kinnaras were commissioned in various halls throughout Shaolin in honor of his defeat of the Red Turban army. A wicker statue woven by the monks and featured in the center of the "Kinnara Hall" was mentioned in Cheng Zongyou's seventeenth century training manual Shaolin Staff Method. However, a century later, it was claimed that the Kinnara King had himself woven the statue. It was destroyed when the monastery was set aflame by the KMT General Shi Yousan in 1928. A "rejuvenated religious cult" arose around kinnaras in the late twentieth century. Shaolin re-erected the shrine to him in 1984 and improved it in 2004. ^ a b Santangelo 2013, p. 217-218 footnotes. ^ Getty (1928), p. 34. ^ Santangelo 2013, p. 217 footnotes. ^ a b c d e f Getty 1988, p. 50. ^ a b c Kalupahana (1992), p. 220. ^ Kalupahana (1992), p. 219. ^ Leviton 2012, p. 232. ^ Power 2013, p. 41. ^ a b DeCaroli (2004), p. 182. ^ a b c d e f g Getty 1988, p. 52. ^ Brancaccio 2010, p. 169. ^ a b Brancaccio 2010, p. 167-68. ^ a b Getty 1988, p. 53. ^ Brancaccio 2010, p. 168-69. ^ Vessantara (1993), p. 162. ^ Davidson (2012), p. 148-153. ^ Davidson (2012), p. 148. ^ Davidson (2012), p. 148-150. ^ Davidson (2012), p. 150. ^ Davidson (2012), p. 151. ^ Davidson (2012), p. 152. ^ This usage of Narayana is not to be confused with one of the many names of the Hindu god Vishnu. ^ Instead of being a stand alone Bodhisattva, Shaolin considers him to be an emanation of Guanyin. Brancaccio, Pia (17 December 2010). The Buddhist Caves at Aurangabad: Transformations in Art and Religion. BRILL. ISBN 90-04-18525-9. Davidson, Ronald M. (2012). Indian Esoteric Buddhism: A Social History of the Tantric Movement. Columbia University Press. ISBN 978-0-231-50102-6. DeCaroli, Robert (2004). Haunting the Buddha : Indian Popular Religions and the Formation of Buddhism: Indian Popular Religions and the Formation of Buddhism. Oxford University Press, USA. ISBN 978-0-19-803765-1. Getty, Alice (1928). The Gods of Northern Buddhism: Their History and Iconography. Courier Corporation. ISBN 978-0-486-25575-0. Getty, Alice (1988). The Gods of Northern Buddhism: Their History and Iconography. Courier Corporation. ISBN 978-0-486-25575-0. Kalupahana, David (1992). A History of Buddhist Philosophy: Continuities and Discontinuities. University of Hawaii Press. ISBN 978-0-8248-1402-1. Leviton, Richard (August 2012). My Pal, Blaise: Notes on a 60-Billion-Year Friendship. iUniverse. ISBN 978-1-4759-4809-7. Linrothe, Robert N. (1999). Ruthless Compassion: Wrathful Deities in Early Indo-Tibetan Esoteric Buddhist Art. Serindia Publications, Inc. ISBN 978-0-906026-51-9. Power, Richard (20 September 2013). The Lost Teachings of Lama Govinda: Living Wisdom from a Modern Tibetan Master. Quest Books. pp. harv. ISBN 978-0-8356-3064-1. Santangelo, Paolo (9 July 2013). Zibuyu, “What The Master Would Not Discuss”, according to Yuan Mei (1716 - 1798): A Collection of Supernatural Stories (2 vols). BRILL. ISBN 978-90-04-21628-0. Shahar, Meir (2008). The Shaolin Monastery: History, Religion, and the Chinese Martial Arts. Honolulu, HI: University of Hawai'i Press. ISBN 0824831101. Tarn, William Woodthorpe (1966). The Greeks in Bactria and India. Cambridge University Press. ISBN 978-1-108-00941-6. Vessantara (1993). Meeting the Buddhas: A Guide to Buddhas, Bodhisattvas, and Tantric Deities. Windhorse. ISBN 978-0-904766-53-0. This page was last edited on 24 March 2019, at 00:26 (UTC).